It is officially sweater weather! 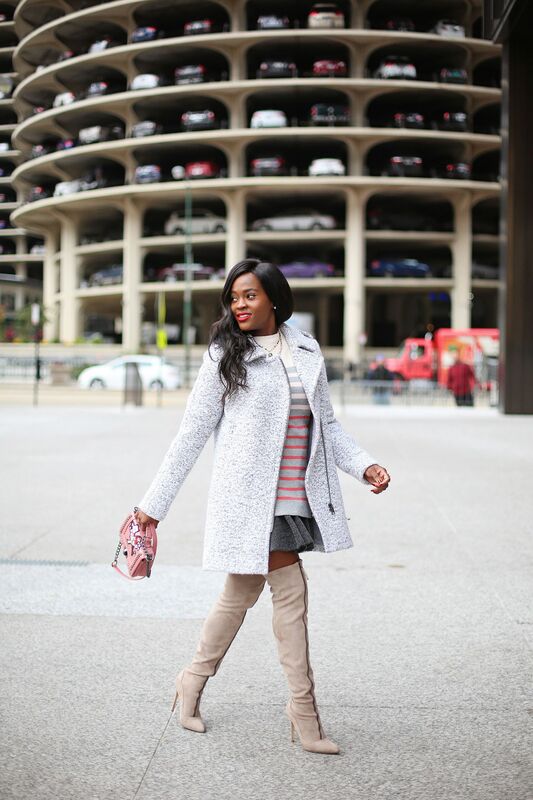 Staying stylish during the Fall and Winter months can sometimes be a challenge but I am sharing some tips on how to stay fashionable. I am always drawn to sweaters with interesting details, anything from bell sleeves to a unique neckline or texture. Those details can elevate your entire look and make you look exceptionally chic. Loft has so many beautiful sweaters that will definitely make your wardrobe anything but boring. I have created two looks from their collection that can take you from 9-5 and then to drinks with girls. This first outfit exudes effortless chic vibes. This look is all about the pops of color and play on texture. The wool Cardigan has a gorgeous soft and fuzzy texture that has a nice contrast against the velvety look of the pants. 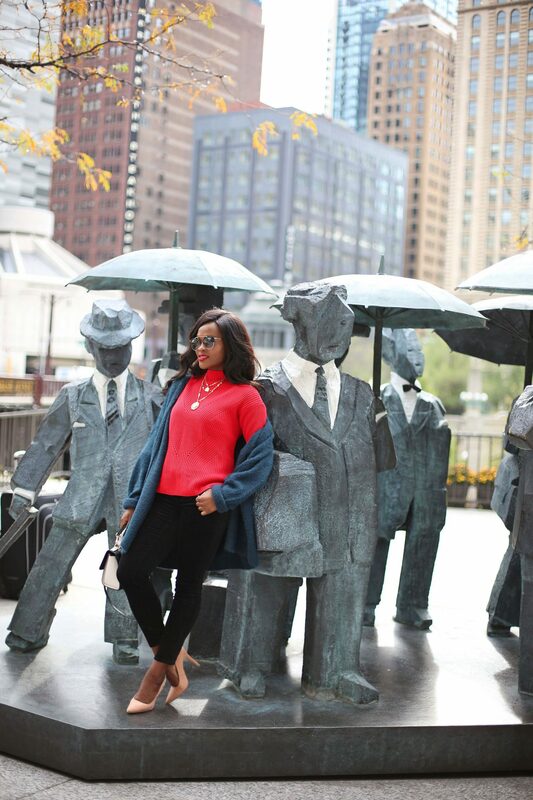 However, your eyes keep getting drawn to the red sweater, which also has the cutest bell sleeves. When worn sans the cardigan, it suddenly becomes a perfect look for happy hour. I would totally wear this to work and feel completely comfortable and stylish. Have you ever had that perfect top or sweater that you wished was also a dress. Especially on those days when you don’t want to wear pants? I do, all the time. A little trick, I usually pair them with a mini skirt or shorts in similar hues to create the illusion of a dress! That’s what I did with this look! 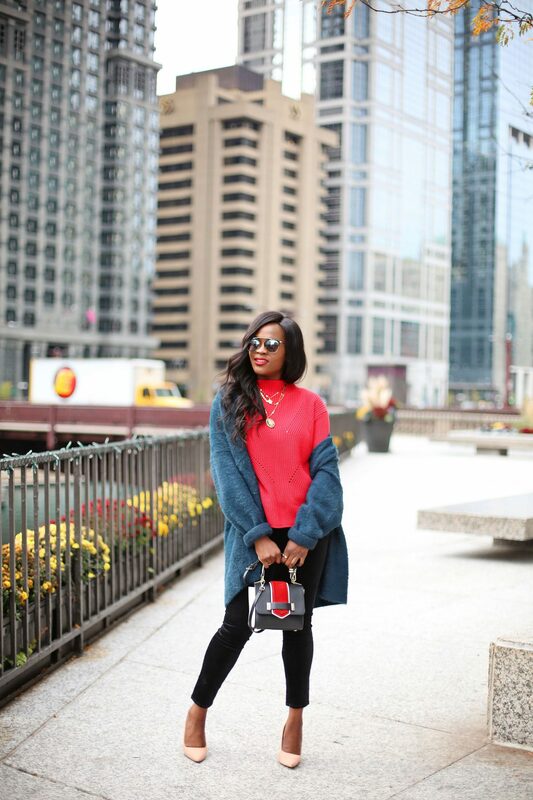 When I saw this Loft sweater, I instantly fell in love and I wanted to create a look that was sassy, playful and chic. I paired it with a herringbone mini skirt from Loft for a sweater dress vibe. For work, you can swap the OTKs with some tights and booties. However, this look is perfect for a fun night out! 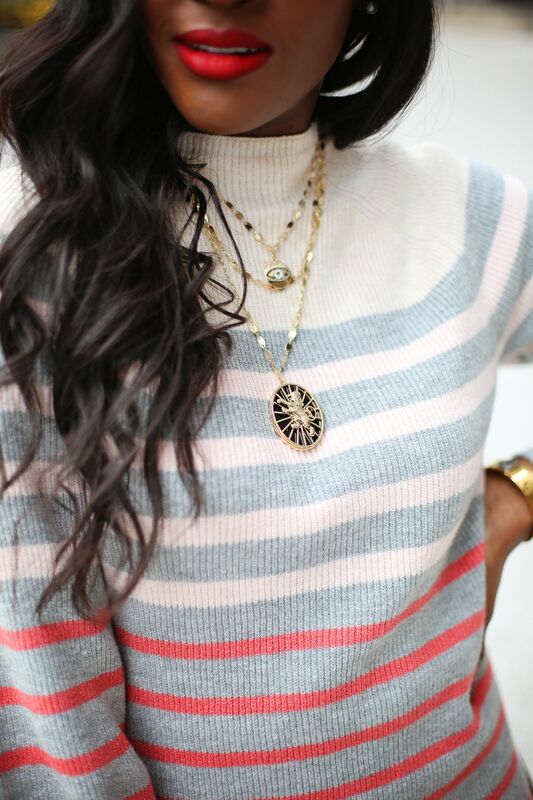 Be sure to checkout Loft for more sweater options! I am also loving the pieces below!